By Xah Lee. Date: 2017-02-21 . Last updated: 2019-01-10 . Most keyboard's keycaps are made of ABS plastic. ABS is short for “Acrylonitrile Butadiene Styrene”. Problem with ABS keycap is that after years of use, the surface of the keys becomes shiny, and also there's a slight dent by wear. After 3 years of heavy typing, the little tactile bump on the key J has completely worn off in one of my keyboard. 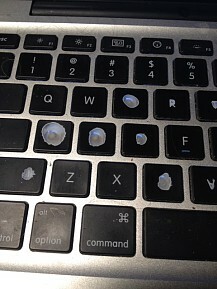 The choice of keycap plastic is tied to choices for the method of printing key labels. Even though ABS keycap has flaws, but it has advantages too. ABS keys is the preferred plastic to double-shot molding. That is because most other plastics shrink too much in the molding process. Legends on ABS keys can also be pad-printed, laser-etched (burned) or laser-engraved (with or without infill). Because of the low shrinkage, some keyboards have space bars made of ABS even if other keys are made of PBT or POM. Note, the “double-shot molding” is one of the best tech for key label, because it mean the label will never wear off. PBT are typically used in more expensive keyboards. PBT (short for “polybutylene terephthalate”) is one of the hardest, most durable materials for keycaps. It is more resilient against heat and chemicals than ABS, but its properties also makes it more difficult to mould, which makes it more uncommon. Legends on PBT keys are often laser-etched or dye-sublimated but only very rarely double shot moulded. Because of shrinkage during demoulding, PBT is also rarely used for the largest key, the space bar, with a notable exception being Cherry. PBT does not turn yellow from exposure to ultraviolet light, like ABS does. The resilience against heat makes it a good candidate for dyeing in a hot dye bath. PBT keys can be found on the IBM Model M, Topre Realforce keyboards, some vintage Apple keyboards and all contemporary grey and some older beige/grey keyboards from Cherry in the G80 and G81 series. Here's examples of keyboard with PBT keycaps. PVC (short for “polyvinyl chloride”) is a relatively hard, middle-of-the-road plastic used in keycaps. Production of PVC is somewhat environmentally unfriendly and it is therefore not manufactured in some parts of the world. It is probably the second most common keycap material, after ABS, widely used by Logitech, Dell, HP, and other mass market brands. PVC has average hardness and friction, but is sensitive to high heat, which will warp it. PVC legends are often pad printed or stickers, due to its wide use in the mass market, though laser printing with infill can also be observed.